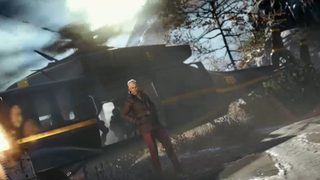 Ubisoft debuted the first five minute of Far Cry 4 during their E3 presentation today and it features a most uptight villain—someone you might remember from the game's box art. The footage, which you can watch above, shows you passing through the Himalayas when all of a sudden your bus is stopped—and everyone around you is gunned down. But then the unnamed villain comes around and seems to recognize you, saving you from being killed. Could he be related to you? It kind of seemed that way, to be honest. Then, after killing one of his minions for not being able to follow directions, he takes a selfie with you. Because memories or something. He seems unhinged, in the same sort of way Vaas of Far Cry 3 seemed to be. A quick aside: I can't believe these assholes killed the monkey. Unforgivable!